We use the protective mechanisms against cold, inactivity, starvation and asphyxiation to develop clinical applications for urgent, medical needs. Sulfateq B.V. has developed a new class of chemicals (patent pending) and their applications, all in the field of cell preservation. In different animal models, these chemicals demonstrate their ability to be used for medical application. These applications are for a real medical need, servicing the blockbuster markets. All these chemicals emerged from the principles acquired in hibernation research. In hibernation mammalian tissue and blood cells are protected against oxidative stress damage as the metabolism changes towards minimal need for oxygen and nutrition. 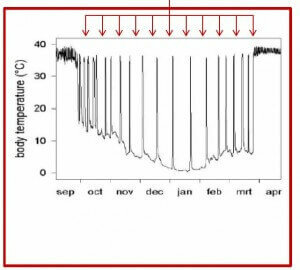 It changes the metabolism and the tissue, the blood cells of hibernating animals can cool down to temperatures just above freezing point without cell damage or even loosing vitality. Bears and other species use the protective mechanism of hibernation. Hibernation is nature’s solution for surviving harsh times. Surviving through a period of low food supply and cold temperatures. Sulfateq BV has a close working relationship with the University of Groningen, especially with Prof. Dr. R.H. Henning and his team, which led to the succesful development and synthesis of effective chemical compounds that can enhance protective processes for human cells and tissue; the so-called ‘SUL-compounds’. 1. Mammal survives by minimizing energy need. 3. Long-term sufferings like hypothermia, starvation and disease susceptibility. 4. The animals have developed a suite of adaptations to protect mind and body. 5. No signs of severe damage to tissue or brain. As a result of a profound academic research of the phenomenon of hibernation of mammals in winter time Sulfateq has been able to use these great adaptations in nature for the benefit of medicine, known as biomimicry. In close collaboration with the University of Groningen chemical compounds such as SUL-138 have been identified and synthesised, Sulfateq has developed these compounds, which enable a phase of hibernation in human cells, cell lines and possibly in tissue as well. Other, similar compounds in the SUL series have properties, which enable organ preservation. Sulfateq has brought this technology to a level where key aspects have been proven and the focused potentials must be further developed. Experiments done in several clinics and institutes already gave promising results for applications regarding organ preservation and drug development as well. We are currently in the development phase with the compounds. One compound has been used in the commercial available hypothermic preservation additive ROKEPIE®-FD01. The main focus of SUL-138 is the prevention of Acute Kidney Injury (AKI) during cardiac surgery. The incidence of postoperative AKI of patients undergoing cardiac surgery is 15-30%, with 1.5 million occurrences a year worldwide. Hence, AKI can therefore be considered a major health risk and medical need. There is currently no prophylaxis available which protects the kidney from injury during major surgery, nor are these available for other organ injuries. With the development of SUL-138 AKI can be prevented, which results in a great reduction in patient morbidity and decrease in hospitalization costs. Moreover, SUL-138 also has multiple applications in other therapeutic areas. Mitochondria are the cell’s source of energy and play an essential role in the proper functioning of cells and organs. Healthy mitochondria generate adenosine triphosphate (ATP), the energy molecule required by our cells and organs to function properly. Mitochondria also produce a minimal level of reactive oxygen species (ROS) as secondary products of respiration. When mitochondria dysfunction, ATP production is reduced and ROS production is increased, with an accompanying increase in oxidative stress. 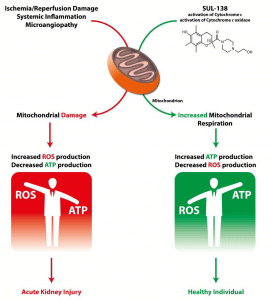 The increased ROS that dysfunctional mitochondria produce can damage multiple cellular components (including DNA, proteins, lipids and the mitochondria themselves), which results in the disruption of normal biological functioning and disease. Mitochondrial dysfunction is believed to arise either as a result of inherited genetic defects or through damage-signals encountered during disease. In either case, the result is the generation of excessive ROS and reduced ATP production. Dysfunctional mitochondria are a key element in a variety of serious diseases (both rare and common), and thus a promising therapeutic target. The development of Mitochondrial Medicines is challenged by the difficulty of targeting the mitochondria (passing both the cellular membrane and the mitochondrial outer membrane) without affecting the mitochondrial membrane potential or causing mitochondrial toxicity. SUL-138 appears to target and protect dysfunctional mitochondria without affecting healthy mitochondria and cells. SUL-138, in preclinical models, is a mitochondrial protective agent that improves cell viability and organ function in several disease models including renal, metabolic, pulmonological and hypothermia-associated disorders. SUL-138 is formulated for systemic intravenous infusion, but oral delivery formulations are currently under development with promising results. In preclinical models, SUL-138 is uniquely able to reach the mitochondria, where it restores electron transport to improve cellular energy production and reduce oxidative stress created by the over-production of ROS. c. Decreases ROS production under pathological conditions. These novel mechanisms ameliorates electron transport deficiencies in disease. Given these innovational mechanisms-of-action, SUL-138 can provide therapeutic benefits in mitochondrial disease, such as Acute Kidney Injury. Acute kidney injury (AKI) is a critical clinical condition with no effective treatment. AKI incidence continues to increase and AKI is associated with high mortality at short and long-term, increased risk of progression to chronic kidney disease and end-stage renal disease. Cardiac bypass surgery is a common cause of AKI in humans with incidences as high as 30%. Survivors of AKI are plagued by a variety of chronic sequelae contributing to decreased quality of life and increased utilization of healthcare resources. The initiation of AKI following cardiac bypass surgery is multifactorial and poorly understood, however ischemia-reperfusion (I/R) injury is pivotal. Hampered kidney perfusion – due to reduced cardiac output, increased systemic inflammation, hemodynamic alterations, volume depletion and perioperative administration of nephrotoxic drugs – contributes to I/R-induced AKI following cardiac surgery. Acute kidney injury (AKI) is defined by an acute rise in serum creatinine levels or decrease in urine output. As the bulk of renal cell mass is composed of tubular cells. Tubular cell death or injury is the main morphological feature of AKI. Tubular cells are extremely rich in mitochondria and mitochondrial abnormalities are a key feature of AKI. This mitochondrial injury progresses into mitochondrial dysfunction, resulting in the inability to generate ATP and excessive ROS production (oxidative stress) and, thus, leading to cell injury. As a consequence mitochondria are therapeutic targets in the treatment of renal disease. Mitochondrial dysfunction is a key pathophysiological element in AKI during both the initiation and recovery phases. Ischemia results in rapid tubular mitochondrial fragmentation and shortening. The mitochondrial membrane potential and mitochondrial respiration decrease while mitochondrial ROS increases. This results in ATP depletion, lipid peroxidation, and the release of proapoptotic proteins. Reperfusion, or kidney reoxygenation, results in rapid restoration of mitochondrial respiration and a burst in ROS production. However, the mitochondria remain impaired in their ATP synthesizing function. Thus, ATP recovery is often delayed, which inhibits the initiation of energy-dependent cellular repair mechanisms, and contributes to persistence of AKI. SUL-138 maintains mitochondrial bioenergetics under pathological conditions such as ischemia/reperfusion and thus counteracts the processes that underlie the formation of AKI, i.e. tubular mitochondrial dysfunction. Maintenance of ATP generation under ischemic conditions and decreased ROS formation upon reperfusion protect the tubular cells from injury, whereas accelerated ATP formation would allow for repair of damage encountered during the ischemia-reperfusion phase. A lot of research is being done in this field at the moment. That's why we make sure to keep you up to date!